The version of War and Peace I read a couple of years ago wasn’t the one I’d grown up staring at on my mother’s book shelves. That one came in two volumes, with black spines, and their ‘WAR AND PEACE 1’ and ‘WAR AND PEACE 2’ seem iconic to me now. The edition of ‘The Cossacks’ in the picture to the left is in the same format, and Anna Karenin turned out, when it arrived in the post this week, to be a ’70s TV tie-in. There is a soft focus photo on the front of a woman in furs standing next to a locomotive wheel which is as tall as she is (it missed her that time, anyway). This was pretty disappointing, I wanted the black expanse and the small, white lettering of the non-TV version. The text is the same, Rosemary Edmonds’ 1954 translation, and that is probably the main thing. I want to get away from the too-modern feel of Anthony Briggs’ War and Peace (very readable and energetic though it was), and what I read online of the modern Pevear / Volokhonsky Anna Karenina doesn’t sound promising. The durability and magic of the novel form lies in the fact that, having gained a certain level of currency, the latest novel is immediately absorbed into the field of pre-existing literature, and becomes the thing the next novel has to be written against. Her ideal is for fiction to ‘capture real life by describing the disjuncture between pre-existing literature and the historical present’. Culture talks to itself, reacts against itself, it is constantly on the move. The Possessed brings together previously published articles about being an academic studying Russian (and sometimes Uzbek) literature. It reads like a single work though, largely due to the three long ‘Summer in Samarkand’ sections, in which Elif and boyfriend Eric spend the summer in Uzbekistan, she to study the Uzbek language and what has been designated (which turns out to be not so straightforward) its national literature. They are at the mercy of their host, Gulya, who is both over-protective and cynical – late on in the stay the couple realise that the ant-infested vat of marmalade they get to use for their toast is used only by them: there is another kitchen which the family uses, and which has a sealed vat of marmalade. Incidental details of this sort are mixed in with academic activity – reading books, in other words, slots into life here much as it actually does. It’s a very engaging approach, and useful in the opportunities it gives for parallels. For instance, the character Stavrogin from Dostoyevsky’s The Possessed (AKA Demons AKA The Devils) is ‘unspeakably elegant, irreproachably dressed, eerily handsome’ (p. 256) – everyone falls in love with him, he couldn’t care less and his whole circle ends up destroying itself in one way or another. This is neatly tied to a period of study under adherents of René Girard’s notion of ‘mimetic desire’, and to the similar effect that one of the students, Matej, has on Elif and the rest of the class. They can’t resist the stare. Via the study she works out why The Possessed makes more sense than its disordered emotional carnage would initially suggest, and via Matej she sees the effect this kind of charisma can have on a group. A combination of intent and accident gets her where she didn’t know she wanted to go. Quick in his motions, and understanding how to maneuvre the lantern in accordance with his wishes, the young police agent explored the surroundings in a very short space of time. A bloodhound in pursuit of his prey would have been less alert, less discerning, less agile. He came and went, now turning, now pausing, now retreating, now hurrying on again without any apparent reason; he scrutinized, he questioned every surrounding object: the ground, the logs of wood, the blocks of stone, in a word, nothing escaped his glance. For a moment he would remain standing, then fall upon his knees, and at times lie flat upon his stomach with his face so near the ground that his breath must have melted the snow. He had drawn a tape-line from his pocket, and using it with a carpenter’s dexterity, he measured, measured, and measured. Always suspect that which seems probable; and begin by believing what appears incredible. It turns out that this is fair criticism. 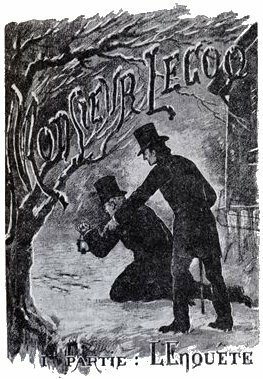 In the early chapters, Lecoq is brilliant, reconstructing the events which led up to the triple murder in Widow Chupin’s tavern: two men shot dead, and a third with a fatal wound to his neck; an armed man found barricading the way to the back exit with a table. The police burst in, catching him red handed. Lecoq steals around to the back and cuts off his escape, and the man exclaims, ‘Lost! It is the Prussians who are coming!’ This is the first of Lecoq’s clues, and one of many which lead him to suspect that the prisoner is hiding his position in society, a crucial point in establishing his crime as murder (he claims self defence; Lecoq needs to establish some political motive). Once the man, May, has been taken away, Lecoq and his simple but loyal assistant Father Absinthe stay behind overnight to look for further clues. They follow two sets of footprints from the back door over the snow covered ground, Lecoq demonstrating that the purpose of May’s barricade was to cover the escape of two women, whose movements he is able to describe with uncanny accuracy. The prints of a male accomplice are also identified, and the height of this man, and the colour of his coat, emerge from the smallest of clues. But Lecoq is not free, as Holmes is, from the procedures of justice. When it begins to rain, he frantically looks about for a method of preserving the footprints in the snow, eventually scraping some plaster from a wall and fashioning moulds from boards and boxes. 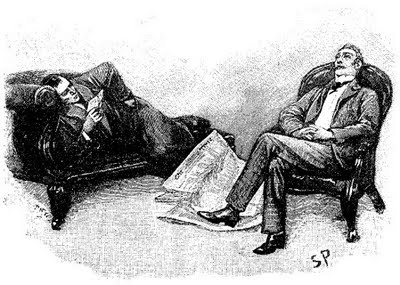 Holmes would not have bothered with this, nor with the long interrogation to which May is submitted, and during which he is unhelpfully kept informed of the police’s suspicions by an insider (Lecoq suspects his jealous boss, Gevrol), allowing him to avoid all the traps set for him. The internal politics of the Palais de Justice and the Prefecture de Police come ever more to the fore, and slowly but surely the case which had started so promisingly gets bogged down in bureaucracy and deliberate obfuscation. In this, it reminded me of the recently screened third series of French cop / law TV drama Spiral: for both stories, the identity, character and connections of the all-powerful investigating magistrate are the most important feature of an investigation. It’s remarkable that the such similar stories can be told about 1869 and 2010. M. Segmuller is on Lecoq’s side, but their position becomes more untenable the longer the interrogation goes on. Lecoq is sure that May can’t be who he says he is, a wandering circus showman, because such a man would not have had the education necessary to make the remark, ‘It is the Prussians who are coming!’ (a reference to Waterloo, apparently). It is a weak argument, which smacks of snobbery. In increasing desperation, Lecoq first spies on May from a cavity above his prison cell, then allows him to escape and spends days doggedly tailing him, Father Absinthe in tow, chalking walls when they get separated. Both men wear ridiculous disguises, and take great delight in trying them out on their unsuspecting colleagues. Maybe the twists and turns do get a bit much, but the revelation of the truth is beautifully managed, and you realise the clue was there all along. It comes, at last, from a Mycroft Holmes-like figure, Tabaret, laid up in bed with gout, able to pick out the true explanation from Lecoq’s narrative without getting up. Despite the similarities, this is a different kind of story telling to Conan Doyle’s, one in which the detective is as much involved in the whirlwind of doubt as the reader, and follows up every false trail, energetically, exhaustively, as though it were the true one. No doubt you think that you are complimenting me in comparing me to Dupin […]. Now, in my opinion, Dupin was a very inferior fellow. That trick of his of breaking in on his friends’ thoughts with an apropos remark after a quarter of an hour’s silence is really very showy and superficial. It even turns out that the idea of a character acknowledging the sources involved in his own creation is borrowed from the same Poe story, with Dupin saying that ‘Vidocq, for example, was a good guesser, and a persevering man.’ Here again the reference is disguised as criticism: ‘He might see, perhaps, one or two points with unusual clearness, but in doing so he, necessarily, lost sight of the matter as a whole.’ Presumably this chain of influence stops with Eugène François Vidocq, as he was a real man rather than a character in a book. At eighteen or nineteen I saw Citizen Kane and The Magnificent Ambersons for the first time. You know, the greatest film ever made, and the greatest film ever destroyed by studio cuts. Neither really helped to explain their creator: Orson Welles swaggered in the first, fully in control of a new, wildly ambitious kind of film, bristling with virtuosity and confidence. The second seemed, at the time, a third rate melodrama, mitigated only slightly by its nice camera angles. Soon afterwards I saw him again, on a repeat of Michael Parkinson’s 1974 interview, the 26-year-old boy wonder of 1941 inflated into an unrecognisably grey, podgy 59 (only 59! He looked much older). The interview was fascinating in a way neither film managed, Orson emerging as a vulnerable, infinitely generous raconteur, modest to a fault, and expansive in a thoughtful and endearing way. As he spoke the mannerisms and expressions of Kane lit up the face of this prematurely aged man, it was very moving. I wrote a song about it, which you can hear near the end of Pomp and Circumstance. In the midst of some recent Welles-related repeats on BBC4, I thought to look up the 1974 interview on YouTube, and the whole thing is there. I’ve always thought, too, that My Bloody Valentine’s Loveless embodies this kind of insouciance, in the way it manages to be so overwhelming with apparently no physical effort. And – last ’90s music reference point – Momus seems supremely Montaignian, for his insatiable but detached curiosity. It isn’t that things don’t matter to him, they just generally don’t matter too much. What an efficient, interesting way to live that must be. So how’s it done? The man who venerates literature doesn’t appreciate it; the man who loves it knows that veneration is not a fertile attitude to take. It’s a dead end, a goal, and why bother with those when there are so many interesting digressions to explore? In its own time, the Essays met with the approval of the Catholic Church, which in its antipathy towards Protestantism wanted to discourage enquiring thought in favour of faith. Montaigne’s undermining of reason, as long as it was not applied to the Church itself, could be interpreted as support for the elevated position of priests, cardinals, the pope. 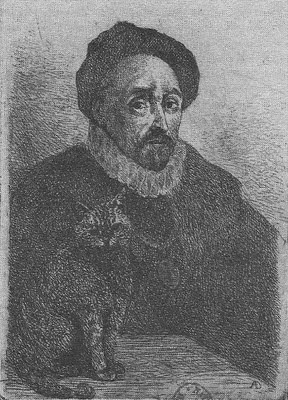 A century later, in Pascal’s time, attitudes were different: doubt ‘belonged to the Devil’ (p. 143), and Montaigne’s insurmountable insistence on it, and the ‘disreputable crew of fops, wits, atheists, sceptics and rakes’ (p. 152) which constituted much of its seventeenth century readership, meant that it was placed on the Catholic Church’s Index of Prohibited Books in 1676, where it remained until 1854. Something real, cool, and solid, lies before you; something unromantic as Monday morning.